Baader Planetarium Solar Viewer AstroSolar® Silver/Gold – MADE IN GERMANY – safely protect your eyes for visual solar observation. This is THE solution to see the partial phase of Solar Eclipses or even big sunspots with your own eyes! It consists of Baader AstroSolar® Silver/Gold Film, with eye-sided reflex-free viewing. Also blocks IR, thus no unpleasant feeling of warmth in the eyeball. Optical Density OD=5,0. CE / ISO certified: conforms to and meets the transmission requirements for eye safety: EN ISO 12312-2:2015 – Instructions in four languages (English, German, French, Spanish) on the inner side of the solar viewer. Safe solar observation! 100% UV-protection, 100% IR-protection, sun light intensity reduced by 99,999%. The Solar Viewers by Baader Planetarium are a high-quality product which is extremely well suited for naked-eye solar observations. The most-common use-case for them are solar eclipses. As the moon passes slowly in front of the sun, you can easily observe how the sun disappears behind it through the Solar Viewer. The spectacular event of a total solar eclipse itself, which usually lasts only for a few minutes, should then be enjoyed without the glasses and safely with the naked eye. However, the SolarViewer can not only be used to monitor solar eclipses. You can also see larger sun spots through it, or simply discover the sun. AstroSolar® Silver/Gold Film has been specially developed for visual solar observation at zero magnification for use with solar viewers. The optical density of Solar Viewer Solar Viewer AstroSolar® Silver/Gold is OD 5.0. Our Solar Viewer are CE-certified and comply to the Norm EN ISO 12312-2:2015 – thus they are certified for a safe and direct view into the sun. AstroSolar® Silver/Gold has no added treatments to attain fine-optical properties necessary for high magnification work. It is not suited to being used in combination with telescopes, binoculars, spotting scopes or camera lenses. Baader Planetarium is producing AstroSolar® Silver Film for more than 25 years. In the year 1999, during the grand total eclipse over Europe, more than 20 million solar viewers equipped with this film were in use. 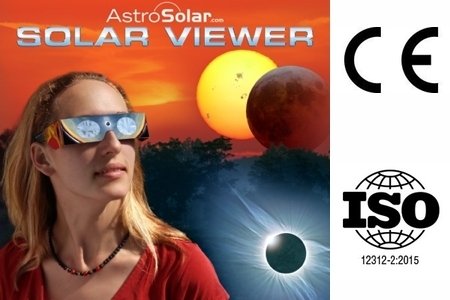 For the great american solar eclipse in USA 2017 Baader Planetarium now introduce the successor to the market: Solar Viewer AstroSolar® Silver/Gold, with eye-sided reflex-free material for an excellent viewing experience. In contrast to the black, soot-filled light-absorbing films of other manufacturers, the reflective metal-layers of our AstroSolar® Silver/Gold Film are much more efficient at blocking the red (and especially the invisible infrared) light, and thus achieve a better security rating at the necessary optical density of OD 5.0. Never look at the sun with the naked eye without a Solar Viewer – danger! Only and exclusively during the few seconds of minutes of totality (when the sun is completely eclipsed by the moon) can you take a safe look at the sun's corona with the naked eye (see image below). 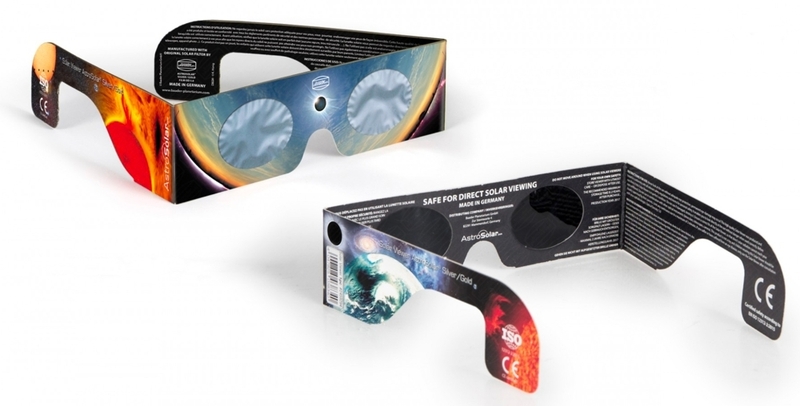 Nevertheless, the complete eclipse, which lasts for hours – from the beginning when the moon touches the disk of the sun for the first time until the end, when it is completely visible again – must only be viewed through a safe and certified solar filter – the Baader Solar Viewer AstroSolar® Silver/Gold. You must use a proper filter at any time for all other kinds of solar observation, too – no matter if during a partial eclipse, an annular eclipse, or simply your daily check for large solar spots. Even if the sun is eclipsed by 99%, the remaining sickle is is still so bright that you must use a good filter. Never even try to look at the sun with your naked eye, regular sun glasses or insufficient filters! Every carelessness when choosing the right kind of protection can cause permanent eye damage or blindness.